17-May-2015 -- Driving today from Wenatchee WA to Bend OR, I hoped to visit three Degree Confluence Points en route. Because I don’t have a boat (and am not a fish), I had to count this first point as an incomplete visit. 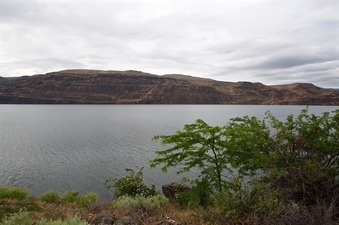 The point lies in the Columbia River, about 0.2 miles from the western bank, and about 0.4 miles from the eastern bank. The eastern bank, however, is much easier to reach; a road runs beside the river bank (ending at a boat launching ramp). Although I couldn’t reach the point in person, I was able to fly my remote-controlled quadcopter out to the point, and record a video with 360 degree views from above the point. In Columbia River, about 0.2 mi from the western bank.